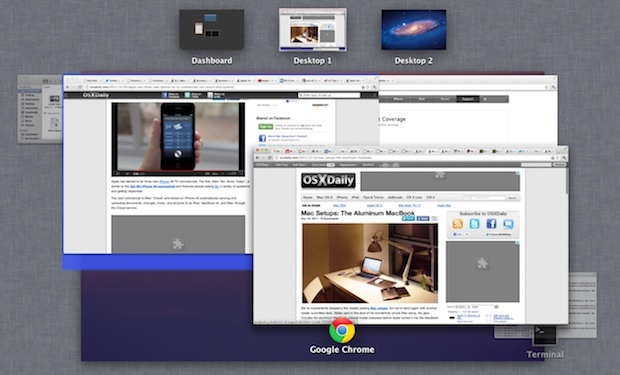 If you have a lot of app windows open in Mission Control, and you are grouping items in Mission Control by application, you can use a neat little trick to zoom into any Mission Control thumbnail on the Mac. This is really easy, all you have to do is activate Mission Control as usual (usually a four-finger swipe up on the trackpad of a Mac) and then hover over a group of windows, then you use a two finger swipe upwards to expand and zoom on just those windows. This makes easier to differentiate windows and select one that may be obscured behind others in the default view. Note that you must have the app grouping feature of Mission Control enabled (found in System Preferences for Mission Control) to be able to access the swipe zoom gesture. Going even further, by using a defaults write command you can also set this zoom feature to show the full size of windows in Mission Control. You can also hover over the window and hit spacebar which does something similar but pulls up a bigger preview. I just found another trick… double tap with two fingertips on an open app icon in the dock, it will bring up expose for that application. It activates the “show all windows” command. Also when inside “show all windows” you can hit the ` key The ~ key is above the tab.